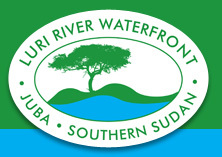 Luri River Development Company (LRDC) is a privately owned property development company made up of Sudanese and international shareholders. LRDC, working together with the local community, has recently secured 100 acres of pristine land on the outskirts of Juba where Luri River Waterfront will be developed. Luri River Waterfront is an innovative and dynamic property development that will feature a mixed use port, industrial area as well as commercial, retail and residential offerings. Residents will have the opportunity to live, work, shop and play within a full serviced, safe, secure and spacious environment on the Nile river, close to Juba airport. This is the first development of this nature in Southern Sudan. It has been conceptualised to meet the business and residential needs of the sophisticated Sudanese market. International investors will also be able to invest in properties and acquire a pied a terre or investment property in Africa’s fastest growing city. Luri River Waterfront provides an opportunity for investors to invest in Sudan’s future and participate in the upside of East Africa’s booming real estate market.